Elestials are a unique kind of crystal. They have several unique characteristics. When a crystal grows normally, it lays down layers of silicon dioxide molecules. The crystal builds itself up gradually by this process. 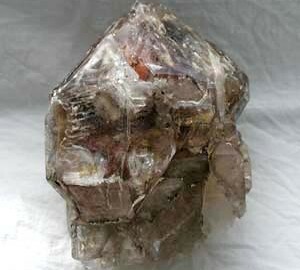 Elestials also are silicon dioxide like other quartz. They can be clear quartz, smokey, amethyst, rose, citrine or a combination of these. Citrine or rose are especially rare. The amethyst and smokey are the most common varieties. 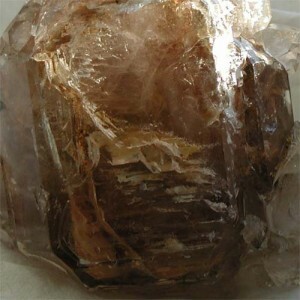 Elestial crystals are also known as jacare or skeletal quartz. The name skeletal is due to the skeletal appearance of marking which are common on elestials. The skeletal markings on an elestial. Sometimes the elestial will have water trapped inside the crystal, which can be seen to move. These are known as an “enhydros”. Due to the exposure to acids and the fast growth, elestials are often not “pretty” crystals. A lot of the time they have a very pitted or rough surface. Elestials are usually not polished, though you will sometime find them polished or even carved into shapes such as spheres. With the rapid growth elestials often trap other crystals within them. It is almost like they are racing, climbing over each other trying to grow. Specific Metaphysical properties of elestials. Elestial crystals share the metaphysical properties of all quartz crystal, however their choice to grow as elestials defines their areas of expertise. The rapid growth that produces the elestial gives the clue to its metaphysical prowess. They have a very fast energy. They do not tolerate negative energy and will grind it up. In this sense they are great for working with transformation. Once you have worked through any negative emotion, visualise putting the emotion into the crystal and ask it to transform the energy to positive energy. You can then come back and visualize taking the energy back from the crystal. Elestials come in a variety of quartz types. The particular type (rose, amethyst etc.) will carry the particular area of expertise of that type. A Specific technique for working with elestials. The key to working with elestials, as with any crystal is personal responsibility (see the Secret of working with elestials). Used in this context, elestials can be extremely powerful tools. This technique uses the transformational power of the crystal to release problems after you have processed it (ie. you have recognised what is happening, acknowledged that you are creating it and why, forgiven yourself, and now are ready to change). For this technique you need some small squares of paper about 5cm (2 inches) square, a pen, an elestial, a cloth big enough to cover the crystal and possibly some blue tack. After you have finished working with an issue or a problem, write the problem on the piece of paper. The essence of your resistance or blockage. Fold the paper in half then half again to make a square. Take the piece of paper and place it on the elestial. If the crystal has places to put the paper they can be used (see picture), but if it does not, use some blue tack to attach it to the crystal. Cover the crystal with the cloth and leave it for as long as is necessary. It may happen immediately, or may take 1-2 days. How will you know when it is done? You may just “know” or you may take a pendulum and ask the question “is it done yet?” If you find that it is taking longer than 2-3 days, you may want to re-look at the issue and ask yourself why you are holding onto the problem. Once you are done, take the piece of paper and safely burn it to finally release the problem.